Extra Large Low Voltage Address Plaque - - personalized lighted address plaque at an affordable price. FAVORITE COMFORT FEATURE: An economical option when shopping for a lighted address plaque. Includes up to five (5) really big 6" black numbers. Features a galvanized steel frame with a tough black powder coat finish. Plaque can be seen up to 100' away at night. Available with either incandescent backlight or LED backlight. The incandescent backlight tends to be softer and yellowish, while the LED backlight is a bright white and will last for years. The large image shows the incandescent backlight. Small image on the left shows the LED backlight. Dimensions: 14.5"W x 7.5"H x 2"; weighs 5 pounds. Note 1: If you are hanging this address plaque in a spot without access to a transformer, you will need to purchase and install either a plug-in or hard-wire transformer (sold separately, item 67029F, see Related Products). 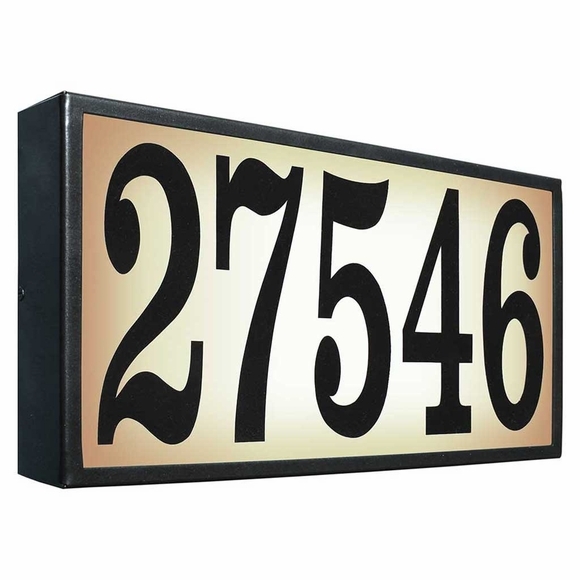 I found a replacement for my dying plastic lighted house number sign at Comfort House online. It was this Qualarc Extra Large Low Voltage Address Plaque. I was drawn to it because of its size, the zinc-plated back, and the powder-coated cover. Our address numbers were installed prior to shipping. It was an easy electrical installation and looks great! You can't miss it as you approach our house. The light is a beautiful warm yellow and the plaque is perfect for our needs. This is a well-made unit and I am very happy with it!